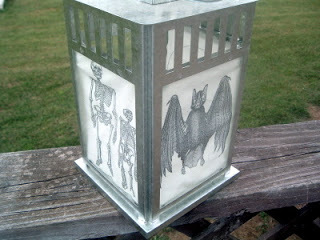 I added a spooky touch to my Ikea lantern….halloween here I come! I just ran some muslin right through my printer and added some spooky images. (love the graphics fairy!) If you don’t remember, just use spray glue to adhere your fabric to some card stock and print on it just like paper! 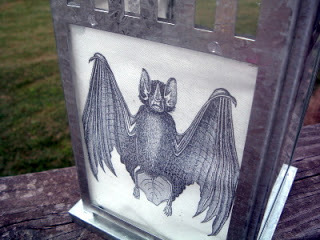 Then I just used some hot glue in the corners to adhere the fabric to the lantern glass. 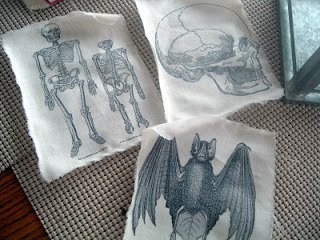 That way I can remove the fabric when halloween is over. 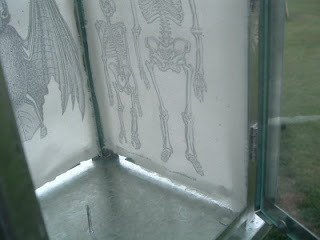 Super spooky, don’t ya think? I will be adding this and more to the shelf in my living room and posting on the nester’s fall mantle party tomorrow. 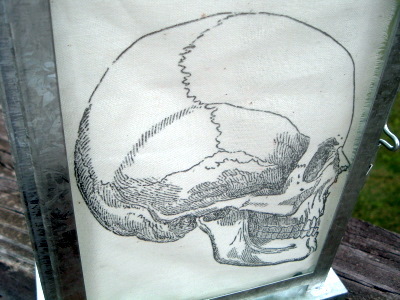 I love this idea, and I never thought of trying to spray adhesive to cardstock and attaching some muslin to print on. What a clever idea. I can think of so many things to do with it now. Oh how happy you have made me this evening. I have several pictures that I needed to print to adhere to a cigar box. This would work wonderfully I do believe. What do you think? I love you lantern and I bet lit up it is phenomenal. Many thanks for the wonderful share. Hope you have a great evening sweetie. You are so creative! I may have to try this. I can’t wait to see what else you are going to come up with. That is so great! We finally got an Ikea in Orlando, I love shopping there, but like eating there even more!!! 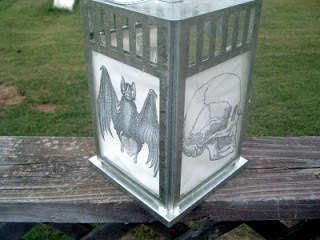 Love the lantern idea – thanks for sharing. Oh how fun that will be Halloween night. Thanks for the inspiration. This is adorable!!! Such a great idea! So perfect for Halloween, and I love that you could change this out with the seasons if you wanted to! Thanks for linking this up to Brag Monday. Such a clever and brilliant idea. This lantern looks amazing. Love the look of this and what great images! Perfect Halloween decoration. Submit it in my Handmade Halloween Contest – starts now! I love the way you dressed up your lantern!!! The images are perfect and they add the right amount of spookiness!!! This looks awesome and thankyou for the tips for printing on muslim!